For printing at home or at work, it's hard to beat the Panasonic KXFL611 for quality and reliability. Some day your Panasonic KX-FL611 will consume all of your printer toner, and when it finally happens you'll soon come to realise that brand new Panasonic KX-FL611 toner tends to be expensive. Fortunately you have no reason to be anxious about dishing out the steep prices you'll see on the high street because right here at Cartridge Save you can buy all the Panasonic KX FL611 cartridges you'll ever need at very competitive prices. Start saving money by buying with Cartridge Save! It's a waste of money buying the KX-FL611 original cartridge or KX-FL611 compatible toner on the high street when it is simple to save a pile of cash ordering with Cartridge Save. Enjoy utter satisfaction when you order KXFL611 toner cartridges from us as they all are underwritten by a no quibble money back guarantee. Remember that every purchase also has free delivery, generally delivered on the following working day! The KX-FL611 multifunctional fax machine from Panasonic is a relatively efficient device for a small office. As an all-in-one communications centre, the Panasonic KX-FL611 monochrome laser fax boasts a large memory, a 14.4Kbps fax machine, full telephony features, and G3 compatibility. Unfortunately, it needs a faster copier and the KXFL611 inkjet fax lacks a few essential features, which could make it more efficient for the workplace. 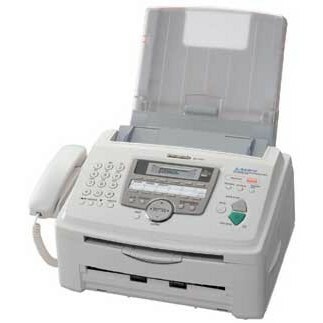 This 6.8Kg multifunction fax machine is surprisingly lighter than its cousins from the same series by Panasonic, yet it retains similar features including the 14.4Kbps fax modem, the busy control panel with a 2-line display screen, and the integration of a telephone handset. Users can load up to 220 sheets of paper into the standard media tray at the back of the Panasonic KX-FL611 laser fax printer. The black toner designed for the Panasonic KXFL611 compact laser fax is known as the Panasonic KX-FA83X printer cartridge. Plain paper faxing means better output that won't fade, while the inclusion of a telephone handset offers more convenience for the communication needs of a small office. The Panasonic KX-FL611 printer can function as a basic copier for small jobs, too, and output can be produced in 600x600dpi. The fax is compatible with G3 technology, and there is a 20-sheet automatic document feeder. The Panasonic KX-FL611 fax machine can store up to 120 pages for transmission. PC connectivity is not available in the Panasonic KX FL611, and the copy speeds are only up to 2ppm. The maximum transmission speed of the fax machine is only up to 14.4Kbps, making the Panasonic KXFL611 quite slow when compared to more advanced machines that have 33.6Kbps modems. Another drawback is the absence of an automatic duplexer.